In this discuss Jeetan Patel's angle ball and what it is not. The content below is old content that comes from the main blog. I'll be looking at it and reviewing it soon. The grip is a contentious issue as it follows that the way you grip and hold the ball has some bearing on the way that you release the ball and the release is integral to imparting as much spin on the ball as possible. All Wrist Spin bowlers of historical note from Grimmett to Warne say the same thing Spin the ball hard. The mantra is that the spinning of the ball is first and foremost and that issues such as line, length, flight are secondary to the ability to get the ball spinning. This it turns out is the Australian approach and has been advocated since the days of Grimmetts first books. If there is one factor in spin bowling which all spinners should accept if they wish to perform to their optimum, it is the concept that the ball should be spun hard. Not rolled, not gently turned, but flicked, ripped, fizzed. Peter Philpott; The Art of Wrist Spin Bowling; 2006; Crowood Press; Wiltshire, England. The grip therefore is important in getting the ball to spin in the way that wrist spinners do. A good wrist spinner is able to impart so much spin on the ball that, as it flies through the air it hums. The basic grip is referred to by Shane Warne as the 2 fingers up, 2 fingers down technique as seen here below. Dependent on the size of your hands in relation to the ball size, your own grip may not match this image. Indeed the idea of the 2 up 2 down finger configuration is a template for a basic starting point. Many people bowl with slightly different looking grips, but in a roundabout manner they are normally modelled on this version. Again all of the master Wrist Spinners say that there is no regulation grip and that if people grip the ball in a slightly idiosyncratic manner and still get the ball to produce a good leg break you shouldn't mess with their technique. But if you're starting out this image above will serve as a good starting point. Most of the advice with regards the grip and how hard you should grip it is standard in that you shouldn't grip the ball hard. The logic behind this advice is that when you bowl your Leg Break well, the whole action is usually performed in a flowing fluid motion where all of your 'Levers' work in tandem with each other to bowl the ball. Tension within the bowling action at any point tends to lead to problems with inaccuracy and dragging the ball down short. With regards how and where the ball sits in your hands - especially if you have large hands will be down to trial and error. I personally use differing positions in the hand to affect variations. I bowl a smaller turning ball that is bowled faster using a slightly harder grip, high in the fingers pretty much as in the image above. But my general leg break is bowled with the ball lower and sitting further into the palm. The most important aspect of the grip though is the position of your 3rd finger on the seam. It's the 3rd finger and it's contact with the seam that is used to impart the spin on the ball. 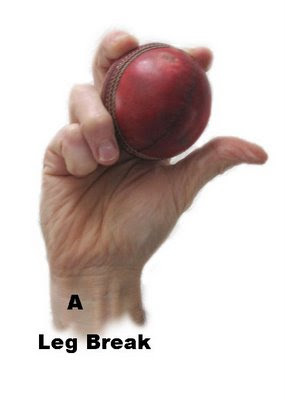 When you release the ball in the bowling action, your 3rd finger is the last point of contact as it's flicked from the hand using that finger to put the revs on the ball. The contact therefore needs to be deliberate and positive and along the seam whilst the '2 Up' fingers go across the seam. Here's a still from http://www.youtube.com/watch?v=EznP02ZQOWE where you can see that the last point of contact is Warnes 3rd finger. I suppose I should tow the party line on Wrist Spinning and advocate the Aussie way and say that it is of utmost importance to spin the ball hard and learn to do so before anything else. I've had discussions with many people about whether there is any merit in establishing first, whether you can actually bowl at all, e.g. straight and there are big differences in opinion. If, you read both Grimmetts and Philpotts books, the premise is that the books are for boys looking to bowl wrist spin, but there is a tacit understanding that, at the 1st stages in the process, your raw material is a boy that can bowl. I would still argue, that even before you start to try and spin the ball you should have a basic ability to bowl the ball seam up with a side on action and a regulation bound. This action should then enable you to get the ball to batsman with a degree of acceptable accuracy. The real leg break requires the big flick. Look at the earlier explanations regarding the throwing of the ball from one hand to the other and the video on-line at http://www.youtube.com/watch?v=U8wAzBKmgYM . As you work on this and get used to the feeling you’ll soon begin to develop an action where rather than just rolling your hand over and round the ball you’ll begin to produce an action more akin to a flick. hopefully this flick will incorporate the use of the 3rd finger, the wrist, the elbow and shoulder in putting the spin on the ball. Again the exact way in which this is done varies from person to person, some people note that the amount of work that the 3rd finger does is such that it produces blisters, Shane Warne apparently was able to produce his spin without having blisters or callouses at all. The important thing is that the flick is there. My own version creates an audible sound not unlike the Flippers click as the ball is flicked off my 3rd finger. In trying to understand the wrist flick and the role the 3rd finger plays my own experience is that the sensation that I have is that I’m primarily bowling the ball off the 3rd and 4th fingers, the rest of my hand apart from the wrist has very little involvement in getting the ball to spin, the thumb and the 2 up fingers only support the ball in holding the ball poised against the fingers that impart the spin. When learning this, note the sideways action of the ball being thrown from one hand across the body to the other right to left with the flick. This is the basis of the leg break with the big flick. This is the action that gives you the flick coupled with imparting spin off the 3rd finger. facing the batsman on release. 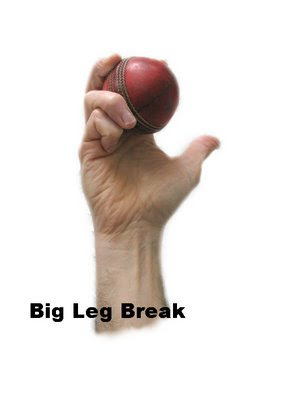 If you are struggling with the Leg Break, one approach is to bowl the ball with the palm of the hand at the point of release facing the batsman. As the ball leaves the hand the last part of the hand that has contact with the ball is the 3rd finger and it’s this that imparts the spin. This approach seemingly doesn’t use any or minimal wrist action but still produces a small leg break with a good degree of bounce. Some people say that as you bring the ball over you should also have a feeling that you’re pushing the ball forward out of your hand rather than flinging it. Also try turning the wrist slightly clockwise so that your thumb comes round towards you and the little finger moves towards the bat so that the hand starts to move towards being in the Karate Chop position. You’ll notice that this small variation in the wrist position will affect the spin and the bounce. This approach would probably fit Philpotts description of you 'Rolling the ball' rather than ripping the ball out of the hand. Many wrist spinners you’ll note will start with their wrists cocked at the start of the delivery and then release the ball with the hand in the ‘Traffic Cop’ position on release. Again if you’re having problems getting your Leg Break together this is an approach that you may want to explore that could potentially lead to a break through or an improvement. 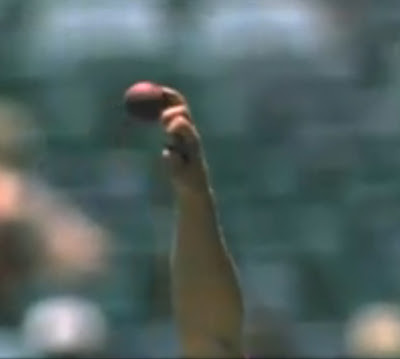 The unfurling of the cocked wrist to the ‘Traffic cop’ position with the palm facing the batsman on release involves a degree of wrist flick and incorporates the 3rd finger as the last point of contact on the ball thus producing the spin. You only have to do this gently over a couple yards so that you can step forward and catch the ball yourself and you can see how readily the ball comes out of the hand rotating perfectly with the seam rotating at right angles to the direction of flight. Again this isn't quite the 'Ripping' phase, but it's an intermediate approach that will produce a Leg Break for many people. At this point I need to mention anomalies in the ability to carry out complex motor activities despite the ability to mentally formulate the action. 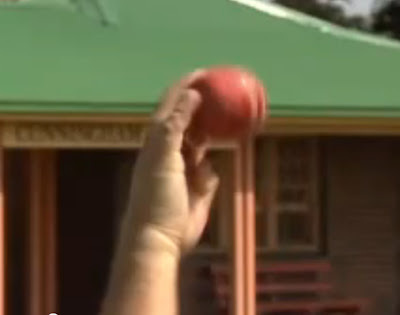 We've seen the need to present the hand in the manner as indicated by the images and we understand that in order to release the ball with the seam spinning approx 70-80 degrees to the direction of flight or thereabouts to obtain maximum turn off the wicket, there can be difficulties in executing this action. Without the use of high speed video recording we're unable to see exactly what it is we're doing as we release the ball. If your motor coordination is perfect, you're not going to have a problem, you'll release the ball in the manner as intended and it will spin in the direction as imparted by the flick and the position of the wrist. The subtleties of the wrist position dictate whether you're going to bowl the Leg Break with differing degrees of over-spin or side spin. If you're able to formulate the action prior to bowling and then execute the delivery with accuracy and consistency you've probably got extraordinarily good fine motor skills. I would suggest that if you do have this kind of control over your Leg Break you should follow all of the guidance with regards to learning how to bowl the Googly e.g. do so with due care and attention to your Leg Break, do not over do the learning of the leg break see http://www.bigcricket.com/forum/t79461/ The consequence of over doing it when learning the Googly is that you end up losing the Leg Break (Googly Syndrome) and my own anecdotal experience to date would suggest that it seems to have an extremely detrimental affect on your ability to contol your Leg Break release (Fine Motor skills). For further reference see the links at the bottom of the page with regards the grip.